dashboardsHelpDesk1220, originally uploaded by rajan_dashboard. 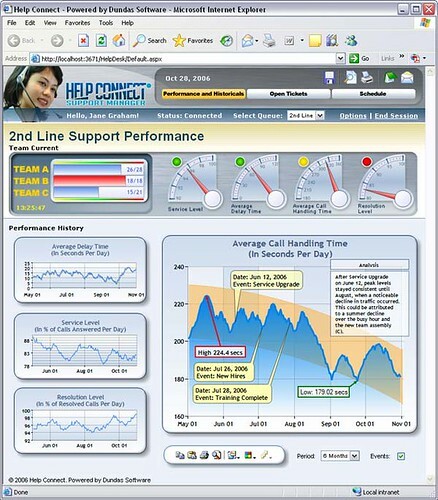 This is a pretty dashboard for help desk personnel. It also has the detailed graph for Average call handling time. The use of Dials is pretty good and saves some dashboard-real estate. The colors are soft and the period parameter is at the bottom which is not a really user friendly. Parameters by default should be either on the top of the dashboard-page or on the left hand side or just near the vicinity of the dashboard object (chart or table).